Super Saturday Savings– and Mashed Potato Faces! with them just a little too, which she has NOT liked to do in the past. Hope everyone has a FANTASTIC weekend!!!!! So THIS year… when I am able to (aka when Scott doesn’t work saturday morning) I am rubbing the sleep out of my eyes and hitting the garages! Because I am one very cheep (I guess money-savy is a better term) Momma! And given my unemployed status, saving money is even MORE important than ever. And clothes for 4 girls gets EXPENSIVE. I know, hand-me-downs. But there is over 4 years between Gabby and Annabelle. 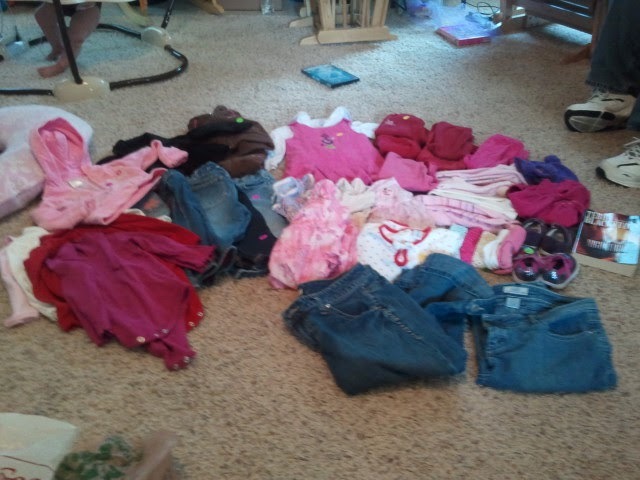 I’d gotten rid of most of the girl baby clothes a while ago. Next year, I’ll have a little more hand-me-downs for her, but to be honest, most of them have gone through 3 children already, so are getting a little rugged. And pretty much everything was in LIKE NEW to excellent condition, too! So, anyway, that was my morning! That, and my daughter, m-i-l and I went on a walk before hand, too. *yawn* Now, I could use a nap! Am I the only crazy garage saler out there?? It was so cute to see the picture of Annabelle trying to eat the mashed potatoes. Your therapist was spot-on in telling you to let her play with her food. I know it goes against our grain as moms to allow this but CHD kids often require this. Also, if your therapist hasn't already provided one, there are some vibrating toys that you can use to play with along the outside of their mouths/cheeks that will help stimulate them, too. We'll keep praying for this area for her. Hang in there! Now, as far as yard sales, I've been trying to have a one myself and sell some of our things but the timing hasn't been right. One of the big obstacles is that we don't have the ideal location at our home to have one so we always have it at my mom's house. So we have two family's schedules to try to coordinate. Also, I've never been one to go yard-sale shopping but I have wanted to do it. Part of my problem is that I'm not a morning person. One of my closest friends is a yard sale pro. Almost every Saturday morning she hits the yard sales with her mom. I guess I need to ask her to take me along some time. She has been wonderful, (along with some other people), to provide us with some of their "finds" or to give us some hand-me-downs! God is sooo good! We continue to pray for Annabelle and the rest of your precious family. How cute to see Annabelle playing with her mashed potatoes. She'll get used to it, playing with food is a great way to learn. But how wonderful you found so much really nice things! Whoa, That is some serious winnings for $25! I'm not normally a big garage saler, just because they can be so hit or miss, and I'm too lazy to spend the time. (Did I just admit I'm lazy?) 🙂 Once in a while, we check out sales in our neighborhood, and we've loaded up on some awesome toys that way! It is a huge blessing to come here and read all those good reports! I didn't realize you weren't working now, somehow I thought your husband was unemployed. So happy the baby is doing so good!!! OH MY! PUHLEASE take me garage sale shopping with you! You have some skills! 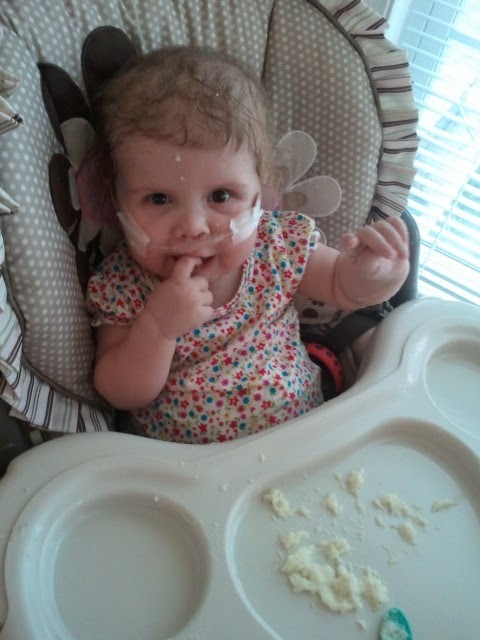 Annabelle looks so cute with her mashed potato face!!! Much love! Tammi, she failed the vibrating toy, pushed it away:-) Totally understand timing for garage sales! My sister and I have at least one a year, we alternate houses. Riete… street markets sound fun!!! Karen… yes, we LOVE our mashed potato faced girl! Casey… I KNEW you were my friend for a reason! Terry… Scott has always worked part-time evenings, watched kiddos during the day while I worked. Now that I"m unemployed and Annabelle needs care, he's trying to get a full-time job, as his little part-time job doesn't even close to pay our bills. It's stressful, but we are believing in our MIGHTY God to provide! Bonnie… You're on! Although, I'm best at kids stuff, HA! So if you don't have kids, I might not be of much help!! How nice to see Annabelle sitting up in a highchair! She'd adorable. Garage/yard sales are great for picking up kids' clothing and toys. If you want to save on groceries and other items, check out websites like Hip2Save and Moneysavingmom.com. I LOVE TO YARD SALE….but without taking the hubs or kids. We have 5 kids so I don't get to go much but when I do go, I normally get LOTS of clothing cheap. I hate paying store prices for anything.